Football season has only just begun, and I’m already fantasizing about all the tasty treats I plan on making for my game day table. And these healthy Baked Onion Rings with Creamy Chipotle Dipping Sauce are sure to be featured (and devoured!). My whole family loved these….even my kids gobbled them up. But the chipotle dipping sauce can get spicy, so I’d suggest keeping that part away from the kiddos. By toasting the panko breadcrumbs a bit before baking the onion rings, you get a really nice crunch to the onion ring. And if you really like a spicy dip, feel free to add more of the chipotles in adobo sauce than what I have listed in the recipe. It’s a bit of work to coat all those onion rings, but boy is it worth it! This healthy dish is a fabulous alternative to traditional fried onion rings. 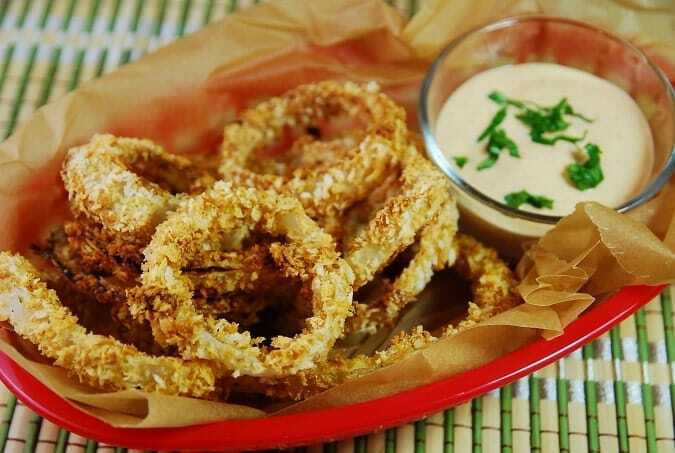 Crunchy, flavorful and served with a creamy, spicy chipotle dip, these baked onion rings are an ideal Weight Watchers snack recipe. Make them for game day, as a side dish to dinner or lunch, or just for the heck of it. Make dipping sauce by whisking together the yogurt, mayonnaise, chopped chipotles, lime juice and sat & pepper together in a small bowl. Cover and refrigerate. Preheat oven to 425. Line a rimmed baking sheet with aluminum foil, and lightly mist with non-fat cooking spray. Place Panko onto baking sheet, and lightly mist bread crumbs with an olive oil mister or non-fat cooking spray. Then sprinkle with some salt and pepper. Place in oven and bake, tossing around a few times to ensure even toasting, until golden brown, about 3-5 minutes. Pour panko into a shallow bowl. Re-spray baking sheet with non-fat cooking spray and set aside. Place the flour and egg substitute each in separate bowls as well. Working one at a time, dip each onion ring in to the egg, shake off excess, then dip into flour and coat evenly. Now dip again into egg, gently shake off excess, and then coat with the Panko breadcrumbs. Place onion ring onto prepared baking sheet. Continue with remaining onion rings. Place in oven and bake, flipping once, until golden brown, about 12-14 minutes. Give chipotle dipping sauce a quick stir, and serve with onion rings. Instead saying print page you need to make your recipes (only) “PRINT FRIENDLY”!! Yeah….I’m a little confused why you would use regular panko breadcrumbs that are made out of white bread that uses white flour, but then use whole wheat flour?? But they sound great…Gonna try making them. The Panko breadcrumbs are airier and less dense, therefore giving more of a crunch to the onion rings. They are also less Points :). Does it need to be whole wheat pastry flour? Hate to buy that when I won’t use it for anything else. Regular flour ok? Thanks!